The Craftsman Premium Rubber Garden Hose had 229 customer reviews and 22 answered questions on Amazon. I've read through the reviews and condensed the results into this report. I hope that this helps you when shopping for a hose. The Craftsman Premium Rubber Garden Hose is made in the USA. It is a heavy duty 50 foot hose that comes with a lifetime warranty. The hose weight is 10 pounds. Some hoses have a long listing of specifics about the hose. Then when you look at the reviews from customers that purchased it, the comments are in direct contrast to how great the description from the manufacturer was. But with the Craftsman Premium Rubber Hose, the description was very brief. I expected the customer reviews might reflect a poor quality. But the opposite was true. Customers really liked this hose. I guess, when something is good, there is no need to go on and on about it in the description. This is a simply built very durable, heavy duty hose that is made to last. Period. So many customers shared stories of how hoses used to be made better from long ago, and how this is one of the few that is still made well. The fact that this hose is real rubber, makes it stand out in an age of retractable hoses and metal bionic hoses. Sometimes the old ways are still the best. One very satisfied customer shared this about real rubber hoses like the Craftsman, "I purchased a real rubber 50' garden hose from Sears when I bought my house in 1982. At about $30 all my friends thought I was out of my mind; in 1982 that was an expensive hose. It has lived in my back yard in the hot Tucson sun completely exposed 80% of the time. It is still flexible and leak free and I am not gentle with it. I wonder how much money my friends have spent on cheap hoses from the big box rip off centers since 1982. I've even punished it with a weed eater on a few occasions. Natural rubber is the way to go and sears makes a great one. The last garden hose you will ever need to buy." This hose is not listed as safe for drinking water. Some hoses are, so if you are wanting a hose for transporting drinking water, you may want to shop for one approved for that job. Just those two words - lifetime warranty, should tell you something. Craftsman stands behind their product. Many customers liked the fact that the company was so sure of the product to give it a lifetime warranty. If you think about it, a company could quickly go out of business if people all started returning a faulty product. When a lifetime warranty is offered, that says to me that they are sure not many will be returned. Many people were sold on the warranty. Here a customer explains why, "For the quality and for the Lifetime Warranty, I'm sold on them and won't waste time on any others from now on." A common thread in the comments was how this hose is resistance to kinks. If you've dealt with kinks in hoses, you probably know how they can waste your time and often your water. When the kink is present water stops, but then you have to either go shut the water off, or just run to the kink and get it out. When the kink is out, the water starts flowing again and can waste out on the ground until you get to the hose end. In short, kinks are a pain. Someone who has a lot of hoses, commented this about the kink resistant properties of the Craftsman Premium Rubber Hose, "I have a large yard with flower gardens and trees, and hence, I have a lot of hoses. These things are much less prone to kinking than cheapo hoses from the garden center or hardware store. Also much easier to roll up. Worth the money in my opinion." The Craftsman Premium Rubber Hose stands out above the rest for it's durability. It is a heavy duty rubber hose that is naturally resistant to kinks and will not leak. If you remember having a quality hose decades ago that just kept lasting and lasting, chances are it was a real rubber heavy duty hose like this Craftsman. A big selling point for many is that the Craftsman Premium Rubber Hose is made in the USA. Another big selling point is that it comes with a lifetime guarantee. Simply put, this is not a cheaply made hose. If you want a hose that is going to last for a long time and survive beatings of being left out in the cold and sun, I would recommend the Craftsman Premium Rubber Hose. Here are some top questions that I found for people considering buying a Craftsman Premium Rubber Garden Hose. Are the brass fittings labeled lead-free? There could be trace amount of lead in the brass couplings, but they are nickle-plated. HealthyStuff.org tested this hose, and found no detectable lead in the water, the hose, or the couplings. They gave it a Low rating on potential toxicity. Is this hose heavy? 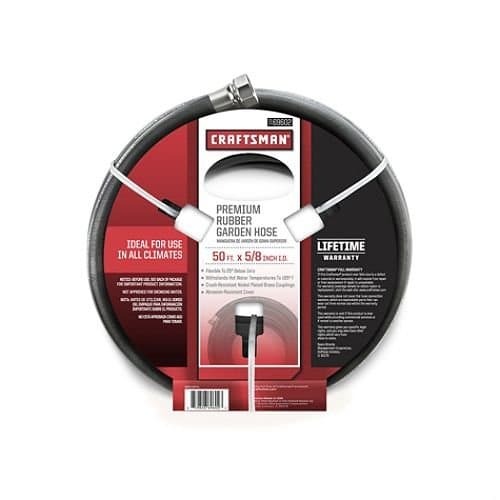 The Craftsman Premium Rubber Garden Hose is not a commercial heavy duty hose, though weighing in at 10 pounds it is also not a lightweight hose either. Is this hose made from real rubber? Yes, it is. That is a big part of what makes this hose stand out above the rest.